There are 43 Assisted Living Facilities in the St. Petersburg area, with 4 in St. Petersburg and 39 nearby. The average cost of assisted living in St. Petersburg is $3,447 per month. This is higher than the national median of $3,346. Cheaper nearby regions include Saint Petersburg with an average starting cost of $2,442. To help you with your search, browse the 251 reviews below for assisted living facilities in St. Petersburg. On average, consumers rate assisted living in St. Petersburg 4.6 out of 5 stars. Better rated regions include Safety Harbor with an average rating of 4.9 out of 5 stars. Caring.com has helped thousands of families find high-quality senior care. To speak with one of our Family Advisors about assisted living options and costs in St. Petersburg, call (855) 863-8283. St. Petersburg, known as the "Sunshine City," has a sizable senior population. Of the city's 263,000 residents, over 17 percent are over the age of 65. To support the older population, the city has 33 assisted living facilities for seniors to choose from. The region has an additional 26 communities outside of the city proper, offering even more choices to seniors. 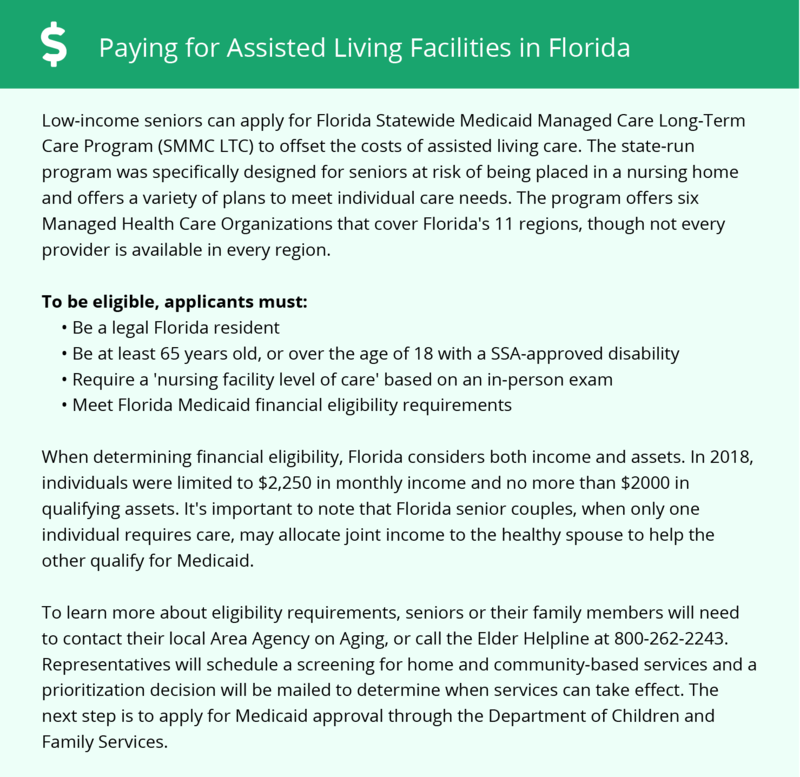 In St. Petersburg, as in the rest of the state, assisted living facilities are licensed and regulated by Florida's Agency for Health Care Administration. There are several types of communities, including standard homes, limited nursing services facilities and extended congregate care. While the overall cost of living in St. Petersburg is about 5 percent less than the national average, this is primarily due to the low cost of housing in the city. Seniors can expect to spend between 2 to 3 percent less on groceries and health care than they would in another U.S. city, though transportation costs about 5 percent more here. St. Petersburg has relatively comfortable temperatures year-round. The January low is a moderate 52 degrees, though seniors who are sensitive to heat may want to find indoor activities to enjoy during the summer months when highs reach the 90s. Public transportation in St. Petersburg is provided courtesy of Pinellas Suncoast Transit Authority. In addition to the Downtown Looper which is a free route on an all-electric bus, there are nearly 50 routes throughout the region. Seniors are eligible to receive discounted fares on all PTSA routes. The St. Petersburg area is home to world-class medical facilities, including Northside Hospital and St. Petersburg General Hospital, in the event of medical emergencies or illness. St. Petersburg has an array of community resources for seniors, including the Office on Aging, an organization that provides educational resources for seniors and advocates on their behalf, as well as two senior centers. St. Petersburg is a member of the AARP Network of Age-Friendly Communities, meaning that its elected leadership “has made the commitment to actively work toward making their town, city or county a great place for people of all ages,” according to AARP. Assisted Living costs in St. Petersburg start around $3,447 per month on average, while the nationwide average cost of assisted living is $4,000 per month, according to the latest figures from Genworth’s Cost of Care Survey. It’s important to note that assisted living rates in St. Petersburg and the surrounding suburbs can vary widely based on factors such as location, the level of care needed, apartment size and the types of amenities offered at each community. Low-income seniors in St. Petersburg may be able to apply to receive financial aid to help cover the cost of assisted living. Although Medicaid HCBS Waivers that covered long-term care were discontinued in 2014, there are still three programs available, including the statewide 1915(b)(c) Managed Long-Term Care program, Medicaid Assistive Care Services and Supplemental Security Income. St Petersburg and the surrounding area are home to numerous government agencies and non-profit organizations offering help for seniors searching for or currently residing in an assisted living community. These organizations can also provide assistance in a number of other eldercare services such as geriatric care management, elder law advice, estate planning, finding home care and health and wellness programs. To see a list of free assisted living resources in St Petersburg, please visit our Assisted Living in Florida page. St Petersburg-area assisted living communities must adhere to the comprehensive set of state laws and regulations that all assisted living communities in Florida are required to follow. Visit our Assisted Living in Florida page for more information about these laws.